This is likely the only 325/12 with a built-in factory compressor circuit in existence. Originally a 325 six-string body with a badly twisted neck, Studio California refitted this short scale Rickenbacker with a copy of the neck that was on our Blue Boy 325C58/12, one of five specially-ordered 325/12s that the factory built in 2004. 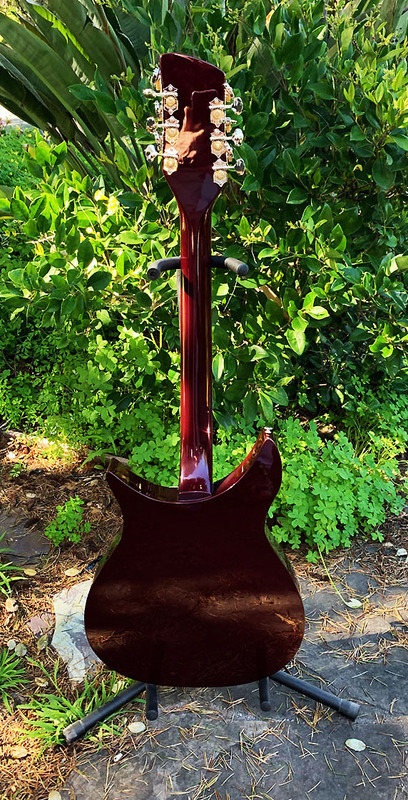 We then finished the raw maple body in a specially-mixed Deep Cabernet Pearlescent paint. The guitar features a Winfield 12-string trapeze tailpiece and twelve 18:1 open Grover tuning machines. Three genuine Rickenbacker toaster pickups were installed. The crowning glory to this one-of-a-kind conversion was the fitment of a genuine Rickenbacker RM 370/12 compressor circuit. 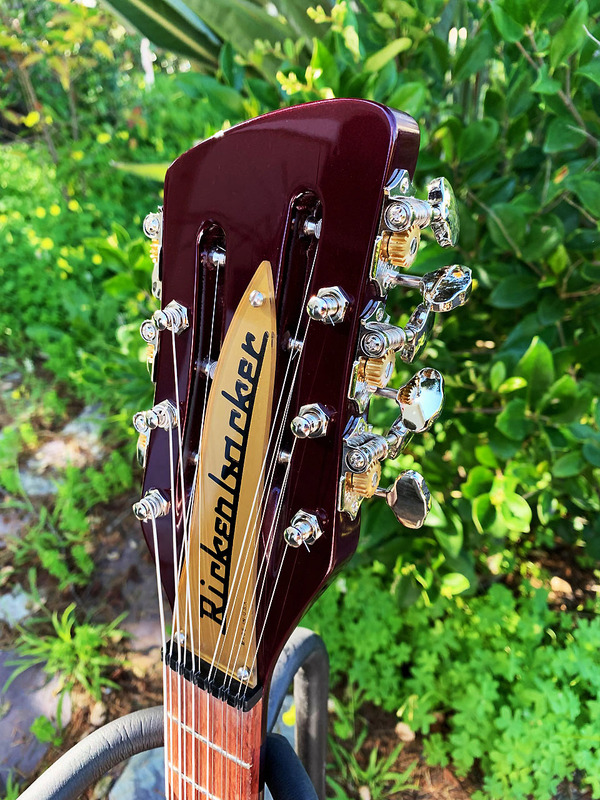 Sharp-eyed Rickenbacker fans will notice the odd spacing of the control knobs, necessary because of the McGuinn’s potentiometers having been mounted directly to the compressor’s printed circuit board. A 9V battery powers the circuit. 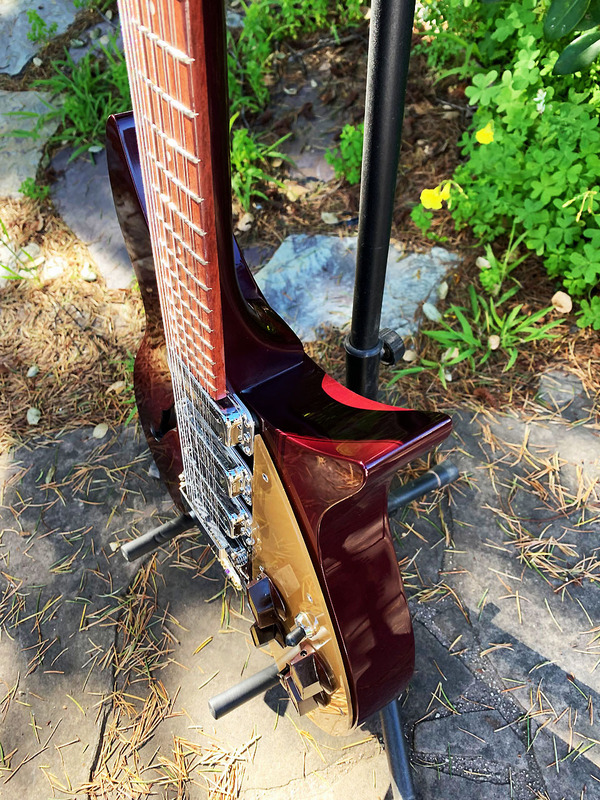 The compressor adds a powerful boost and sharpening of the guitar’s sound when engaged, while maintaining the factory pickup options, which are selectable by a twist of the rotary selector switch on the control panel.